Meta-Game Studies, the editorial by Espen Aarseth in volume 15 issue 1 of Game Studies, is an entertaining and interesting read on the issues of research and peer review in this field. It’s taken a bit of time but the files for the Virtual World Watch (VWW) service are now all back online. The introductory and index page is elsewhere on this website. Though now a fading memory, VWW took up a chunk of working life for several years towards the end of the last decade. It kicked off when Andy Powell, ex-colleague from UKOLN and then the Director of Research at the Eduserv Foundation, spotted I was spending some time in Second Life, wandering around the various education sites. He got in touch and asked if I’d like to do a report for them on this subject. Which I did. The response to the report was somewhat unexpected. Many – and I mean many – academics in UK universities and colleges appeared out of the woodwork and got in touch, some using the report to justify their work to their peers, others using it as leverage to obtain either internal or external funding to continue their research, or to find peers doing similar work in other UK universities and colleges. A bundle of conference presentations, especially in 2009. Podcasts where I interviewed UK academics who were using virtual worlds. Tweets, Facebook postings, and other social media. Several articles in academic journals and other media; for example   and . And, of course, collecting data. Lots and lots of lovely data. Thankfully, we quickly moved away from VWW being solely about the contentious virtual world Second Life, though throughout the life of the service SL remained – arguably regrettably – the predominant virtual world in UK academia. However, the data collection and dissemination was definitely not problem-free. 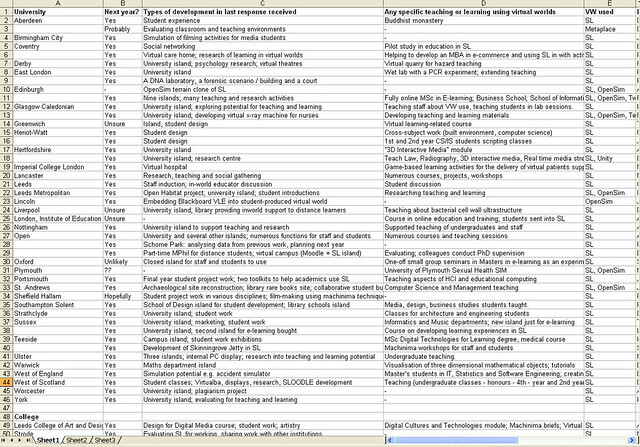 The range of funding for this techology against other EdTech technologies, a dislike of virtual worlds (or anything that looked like a game) in academia, and the (very unhelpful) over-the-top hype in some parts of the media over Second Life contributed to a Marmite-effect, with more than a few vocal academics being entrenched in either near-evangelical advocacy or near-hatred of the technology. Interesting times, though sometimes weary on social media. After several years, things were wrapped up with VWW. All of the snapshot reports, plus three other reports I wrote under my own steam, are online and free. Between them they contain a large amount of data, much of it deliberately unedited (and sometimes frank) survey responses. Do use, but please use responsibly, attributing authors and using their text responsibly and in context. Overall it was an interesting experience, though it feels somewhat unfinished. It’s good to see that quality research has been continuing elsewhere in this field in UK academia (example), though with significant changes in technology, funding, practice and all manner of other attributes, things seem startlingly different now to even just half a decade ago. Another snapshot of virtual world use in UK academia, which would also include a comparison of the data to that of the previous snapshots. I’ve kept all of the contact and other data from the VWW service, so that’s one starting point. A clear-headed analysis of the (still) contentious reasons for and against the use of virtual worlds in education, possibly involving interviews with pro- and anti- academics from back then, and now. I’ll see what happens (and if you are a potential funder then please do get in touch). It would be interesting, and hopefully useful to the education technology community, to be able to provide an enlightened and unbiased retrospective, especially as virtual reality emerges as a viable EdTech.